Since the turn of the decade, Disney has made it their mission to re-imagine their classic animated films into live-action spectacles. Using the original works as launching pads they’ve managed to stretch and re-purpose old ideas for new audiences. Although the end products have varied in quality, their source material is still heralded as animated classics, but do they still earn that distinction? In honor of the recent release of Dumbo, we’ve revisited the original circus to see if it’s still worth the price of admission. The plot is fairly straightforward. Mrs. Jumbo, a circus elephant, receives her first child from a stork. The baby is quickly nicknamed Dumbo by the other elephants due to his enormous ears. Relying on his mother and his only other companion, a field mouse named Timothy, Dumbo struggles against the cruelty of the circus to discover what truly makes him special. 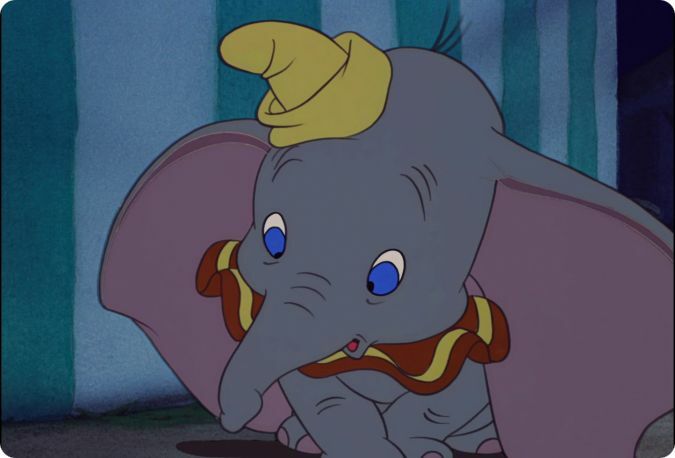 Dumbo was made at a time when Disney was attempting to recoup from the financial hit they took with the release of Fantasia, so the company intentionally targeted simplicity in the film’s creation. Coming in at a tight 64 minutes, Dumbo relies on just a handful of sequences to deliver its message and the emotional punch. There is very little fat on the film, and each set-piece feels essential in the breaking down or building up of Dumbo. This feels silly to repeat in 2019, but the animation team provides the backbone of the film. With Dumbo being one of the few non-sidekick silent characters to lead a Disney feature, there is a sizeable amount of pressure on his design elements to create an emotional attachment for the audience, and it’s almost instantaneous. Watching the little elephant stumble and trip over his own ears is equally amusing and soul-crushing. Dumbo is goofy looking, but he still deserves the best, that precious angel. There is just as much care and attention put into sequences not starring the darling, big-eared mammal. Watching a frantic group of circus clowns smash in and out of frame to put out a fire is only surpassed by a trippy hallucinatory sequence that feels as though it has to have been inspiration for what Disney would pull off when they famously introduced Genie in 1992’s Aladdin. The animators cut loose, and weren’t afraid to flex for the audience. Again, it feels almost redundant to say, but the original Dumbo is time well spent. This was my first time watching the animated feature (at least as far I can remember), and aside from the infamous crow segment that definitely wouldn’t make the final edit today, it stands the test of time. It’s a case study in creating a simple and strong emotional connection without getting lost in your own noise or overstaying your welcome. When you see Dumbo zipping across the sky you’ll be soaring too.